The sun shone as thousands of people enjoyed a great day of entertainment and activities as part of the 2017 We Love Tamworth event in the town's Castle Grounds. After last year's washout, organisers Tamworth Borough Council's Arts & Events were delighted to see the weather behaved itself as an estimated 8,000 visitors flocked to Tamworth Castle Grounds. Visitors who turned up on Saturday 2 September were able to enjoy fairground rides, charity stalls, games, inflatables, a dog show, music from Tamworth Wind Band, demonstrations by local clubs and the return of the popular Children's Zone. Hundreds of children enjoyed face painting, inflatables, art activities and adventure golf in the Children's Zone and around 100 dogs either participated in or attended the dog show. This year's event also had a couple of additional extras in the form of a parade by the Mercian Regiment soldiers and impromptu raves and flash mobs led by the highly talented Mr Wilson's Second Liners. 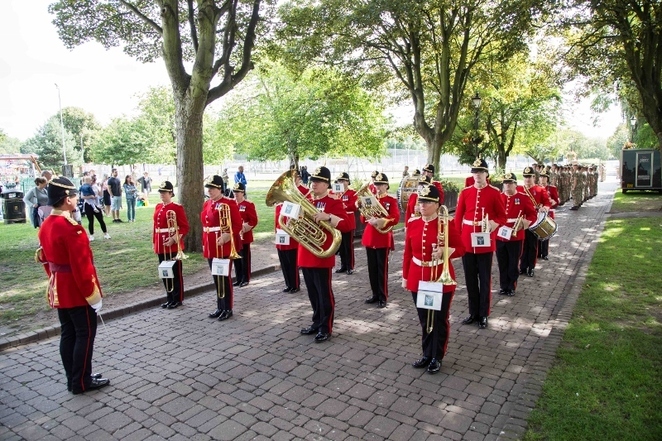 Billed as a street theatre extravaganza, bursting with colour and sound, Mr Wilson's marching band proved a popular attraction as they moved around the Castle Grounds playing modern music on brass band instruments which inspired audiences of all ages to sing and dance along. A particular highlight was when they were joined by members of Tamworth Wind Band who emerged out of the crowd playing their own instruments as part of the 'impromptu rave'. The Mr Wilson's Second Liners appearance was part of the Music Outside element of Arts in Unusual Spaces – a two-year project to bring art into unusual spaces in Tamworth. The nationally-touring group worked with members of Tamworth Wind Band throughout the morning to prepare for the surprise performance. 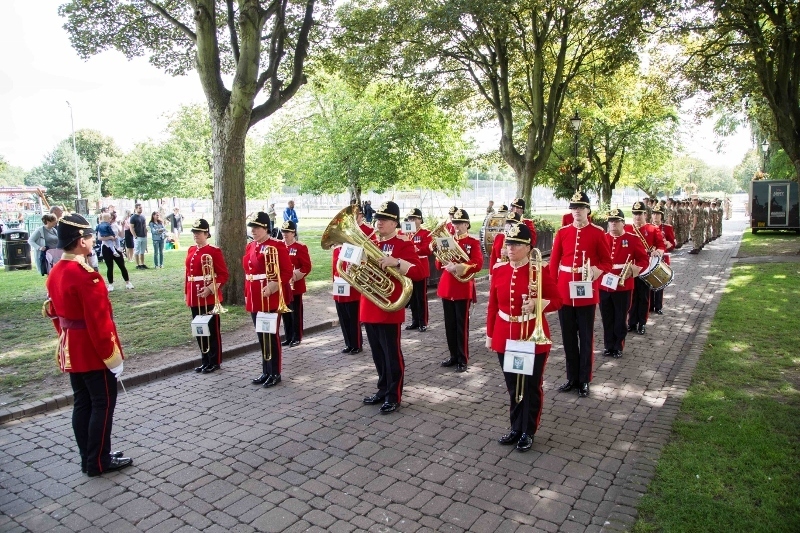 Soldiers of the Mercian Regiment and the Band of the Mercian Regiment paraded through the Castle Grounds and the town centre to mark 10 years since the regiment was first formed in Tamworth by its Colonel-in-Chief HRH The Prince of Wales. Sadly, the regiment was without its mascot, Private Derby XXXI, as the Swaledale ram had to be put to sleep on veterinary advice the day before the parade after being unwell for some weeks. This year's We Love Tamworth event also saw the launch of Focus 24: 24 Hours in Tamworth. 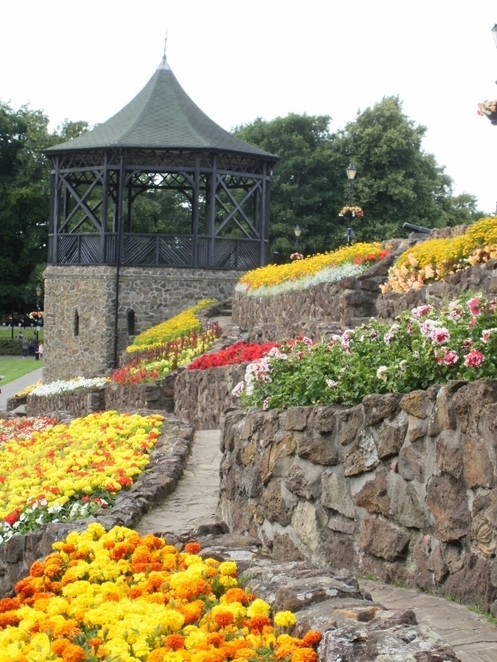 The project, also part of Arts in Unusual Spaces, had invited amateur and professional photographers and film-makers from Tamworth to submit footage of the people, places, objects and experiences of Tamworth, at all hours of the day. A total of 24 photographs, taken by 24 different photographers, have been chosen to represent 24 hours in the life of the town and a unique new film has also been developed to act as a lasting legacy. The photographs and film were revealed for the first time at We Love Tamworth and are on display for 24 days – until September 26 – in Ankerside Shopping Centre in Tamworth town centre. 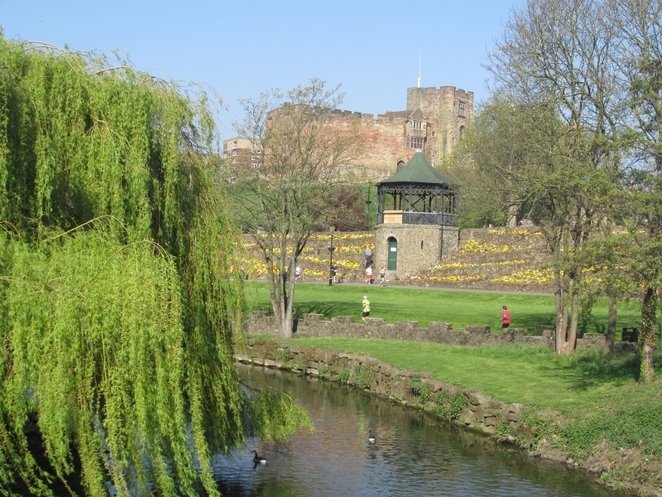 Councillor Joy Goodall, Tamworth Borough Council's Cabinet member for Environment and Culture, said: "This was an amazing We Love Tamworth event. The Arts & Events team pulled out all the stops to create a fantastic and memorable day for families. As well as all the popular favourites, such as the Children's Zone and the wide array of charity stalls and displays from local groups who all help to make a difference in Tamworth, this year's event also had some brilliant new features. Mr Wilson's Second Liners, for example, were truly amazing and enjoyed by all. It's always an honour to see our brave soldiers parading through the town with which they are so closely associated and Saturday's parade was no different. I was also looking forward to seeing the Focus 24: 24 Hours in Tamworth images and film and I'd urge people to take advantage of the opportunity to see the exhibition while it is on display before September 26. A huge thumbs up to everyone involved in organising another fantastic community event."